Are You Ready To Learn About Sentence Structure? Thank goodness for sentences and sentence structure. Sentences are nice little packages of words that come together to express complete thoughts. They make it easy to understand ideas and learn information. 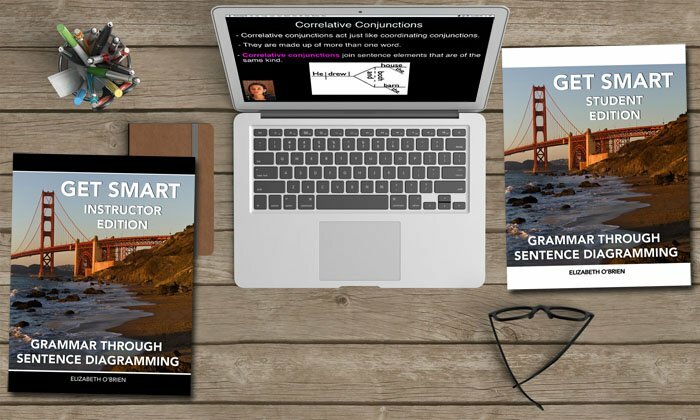 On this page, you're going to learn about simple sentences, compound sentences, complex sentences, and compound-complex sentences. I'm also going to show you how to diagram those things because sentence diagramming is super-duper helpful when it comes to SEEING a sentence's structure. In order to be a complete sentence, a group of words needs to contain a subject and a verb, and it needs to express a complete thought. If a group of words is missing any of that information, it's probably a sentence fragment. If you have a group of words containing two or more independent clauses that are not properly punctuated, it's probably a run-on sentence. Okay, now it's time for us to explore the four sentence structures! A simple sentence contains only one independent clause. An independent clause is a group of words (with a subject and a verb) that expresses a complete thought. Here is a sentence diagram of a simple sentence. Note that there is only one horizontal line. I kicked the ball is an independent clause. It contains a subject (I) and a verb (kicked), and it expresses a complete thought. Learn more about the simple sentence here. 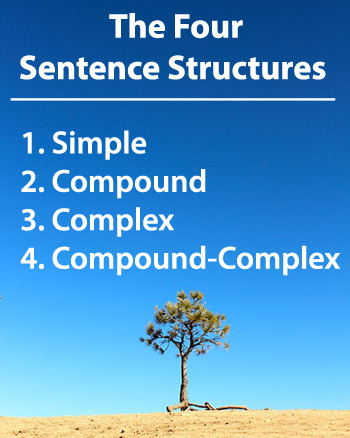 By the way, simple sentences can have compound elements. Jeremy and I kicked the ball. That sentence has a compound subject. Don't confuse these simple sentences with compound sentences. 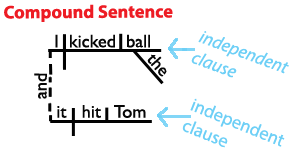 A compound sentence contains at least two independent clauses. These clauses are joined by a coordinating conjunction or a semicolon. A coordinating conjunction is a word that glues words, phrases, or clauses together. 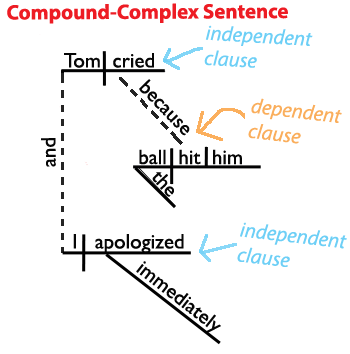 Here's a sentence diagram of a compound sentence. Note that there are now two horizontal lines and one is directly below the other. I kicked the ball, and it hit Tom. I kicked the ball is an independent clause. It hit Tom is also an independent clause. And is a coordinating conjunction joining the two independent clauses. I kicked the ball, and it hit Tom is a compound sentence. Learn more about the compound sentence here. When you join two independent clauses with only a comma, it's called a comma splice. Some sentences might seem like they are compound, but they are actually simple. Learn more about the differences between simple and compound sentences here. A complex sentence contains a subordinate clause and an independent clause. A subordinate clause is a group of words that has a subject and a verb but does not express a complete thought. 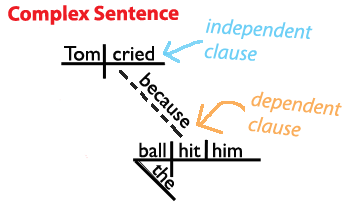 Here's a sentence diagram of a complex sentence. Note that there are still two horizontal lines, but one of them is below the other and moved to the right. Tom cried is an independent clause. Because the ball hit him is a dependent adverb clause modifying the verb cried. Tom cried because the ball hit him is a complex sentence. Tom cried because the ball hit him. Sometimes, it can be hard for people to tell the difference between compound sentences and complex sentences. You can learn more about telling the difference here. Learn more about the complex sentence here. These are sort of like a mash-up of compound sentences and complex sentences. They contain at least two independent clauses and at least one subordinate clause. Here's a diagram of a compound-complex sentence. Note that it's a hybrid of a compound sentence and a complex sentence! Two of the horizontal lines are directly above and below each other and the third is hanging out there in the middle. Tom cried and I apologized immediately are both independent clauses. They're being joined by the conjunction and. Because the ball hit him is a dependent adverb clause modifying the verb cried. The whole sentence is a compound-complex sentence. Learn more about the compound-complex sentence here. Tom cried because the ball hit him, and I apologized immediately. The great thing about diagramming sentences is that it shows how the parts of a sentence are related. 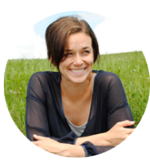 Being able to see a sentence drawn out will help you understand sentence structure. Give it a shot! 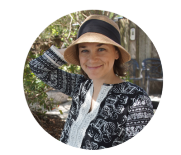 Learn how diagramming can help you avoid sentence ambiguity. We are currently on lesson 10 and my children's confidence level has increased immensely! 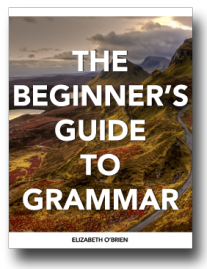 One of my pupils who most struggles with grammar has really turned a corner after watching some of your videos that accompany the Get Smart series. I don't think I've seen her have such a broad grin on her face in an English class as I did last Tuesday!